It's only been a week since I made my first wedding cake. This weekend another wedding took place at the resort. The bride and groom asked for a chocolate mud cake. It was the same flavor as the one I made a week earlier but this time the cake had to be decorated with white icing ( fondant). Thank goodness! Cakes look smoother and more professional if covered with fondant than just plain frosting so I prefer working with the first. My boss sent me a picture of the model cake. It was a two-tiered cake with white ribbon tied around the bases and fresh flowers accented the sides and top. Since orange was the color scheme for the wedding, my boss and I agreed to go with orange ribbon. Our decision did not disappoint. 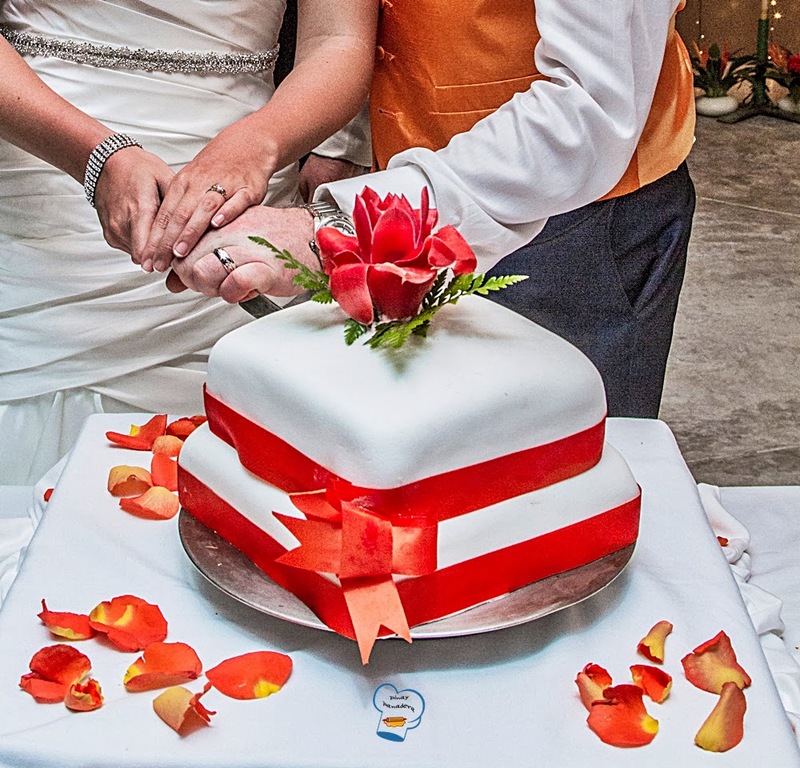 The ribbon gave the cake a striking look. The big day was on Saturday so I didn't get the chance to take a picture of the cake with decoration. Thanks to my boss, she forwarded me a picture she took on the wedding day (Picture above). The bottom and top tiers had only 1 inch difference in size. I should have made a smaller cake as I found out the top tier was too big when I stacked it on top of the bottom tier. See what I meant in the picture below? It would have created a better look if the bottom tier was a lot bigger. That's the lesson I learned.